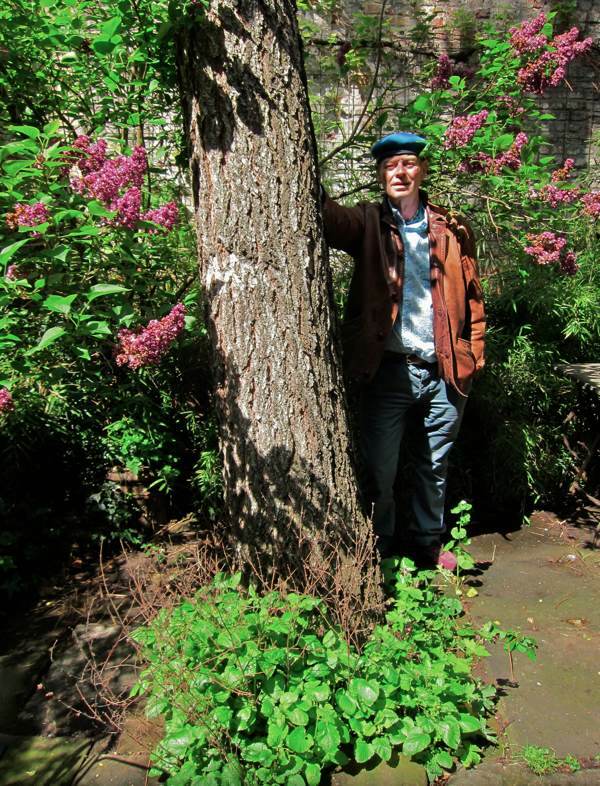 Rodney with the birch tree he planted in Fournier St in 1985. 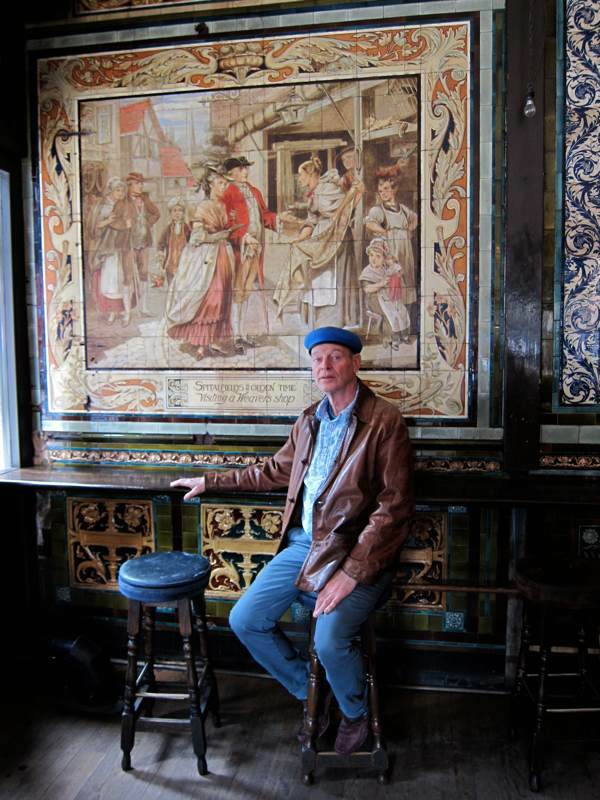 Rodney Archer is one of Spitalfields’ most popular long-term residents, and over the years he has seen many come and go as part of the transformation that has overcome the place since he came to live here in 1980. 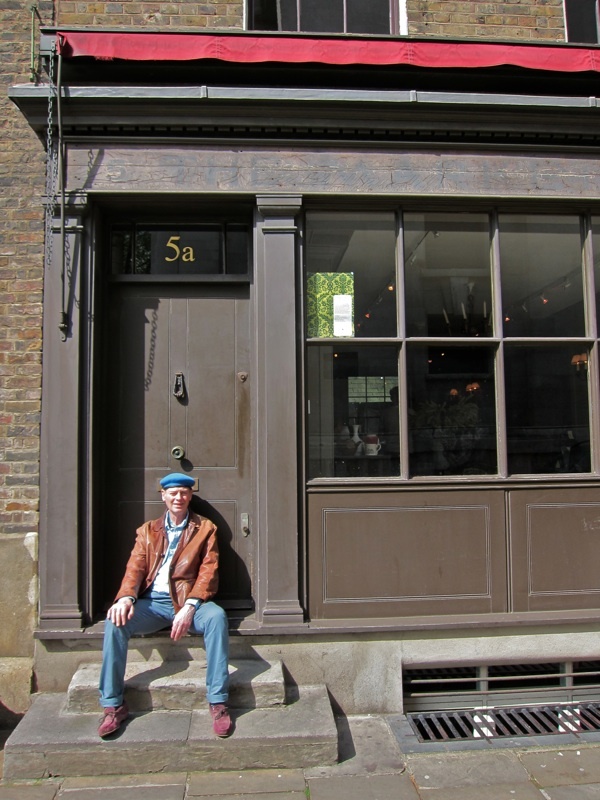 Among the the few occupants that is not a millionaire in Fournier St today, Rodney delights in the patina of ages’ past that dignifies his ramshackle old house, enhanced by all the glorious paraphernalia he has accumulated over the last thirty years, including – most famously – Oscar Wilde’s fireplace which is installed in his living room. Across the street from his front door, Rodney showed me the former home of his friends Eric & Ricardo. “I came to Club Row in 1970 to buy kittens, but the first time I was invited over was in the mid-seventies when I came here for lunch. I asked Eric & Ricardo to let me know if a house came up in the street and the first one they called me about was the one I live in now. ” he recalled, “It changed my life. It was the beginning of being happy, and it was Spitalfields that did it. 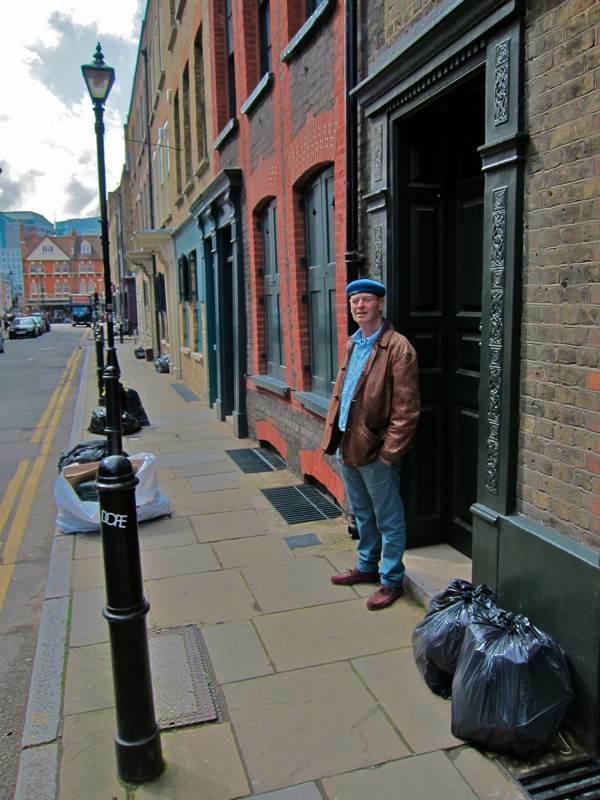 I had never felt comfortable where I lived before.” Rodney came to Spitalfields after his mother broke her hip and the doctor told her she had to live with her son, and so they shared the house in Fournier St. “All the basements were workshops for leather goods then, and there was Mr Lustig the tailor, and Solly at Gale Furs who’d been there since the thirties,” Rodney said, casting his eyes up and down street as he thought back over the years. Across the street, we stood outside another grand eighteenth century house. 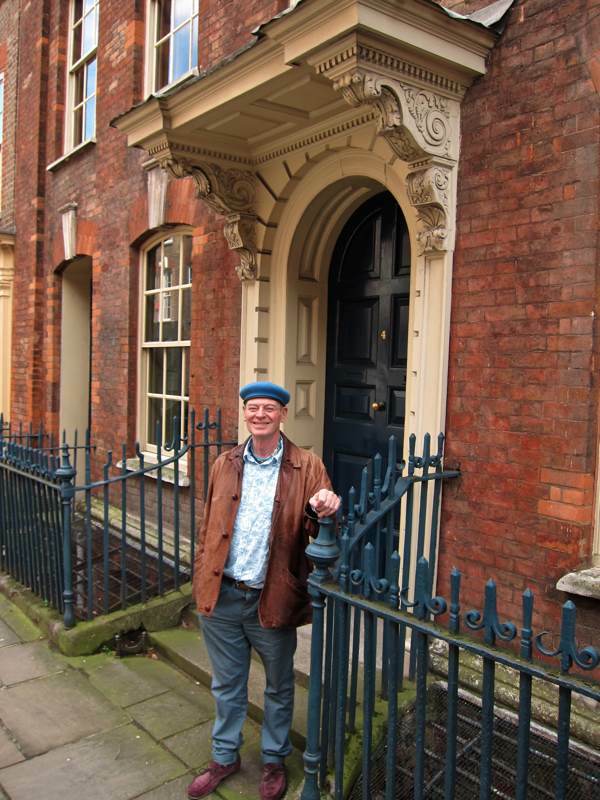 “My friend Julian lived here,” Rodney explained gesturing towards the unyielding door with a smile, “He used to give elaborate dinner parties in the eighteenth century style with footmen. There were no lights and the place was painted in the original colours, so it was very dark and atmospheric. At one point, Dennis Severs, Julian and I spent a day scumbling the front room together – we were pretty close.” Today, Julian lives in a castle in Ireland, Rodney informed me. Rodney outside the former home of his friends Eric & Ricardo. Rodney outside the house where he mixed all the plaster for the walls. Rodney outside the former home of his friend Julian. Rodney outside the former Market Cafe, run by brother and sister Phylis & Clyde between 1947 and 1997. Rodney at The Ten Bells where he once spent New Year’s Eve. 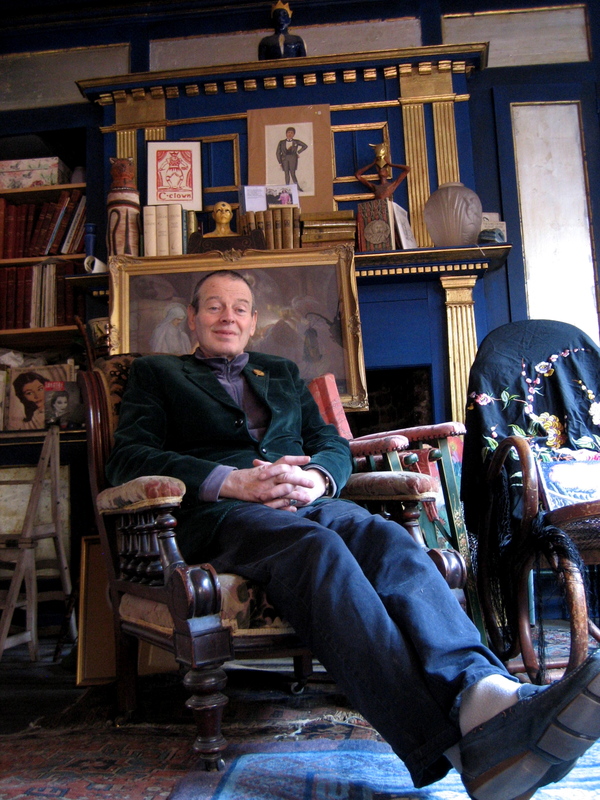 Rodney in his living room with Oscar Wilde’s fireplace. I wonder if Rodney camped in Algonquin Park. Fun to imagine that. Also, I’m not sure about that being a silver birch, which has papery white bark. But without being able to see the canopy, I’m not sure what it is. What an interesting man, and having read your original profile can see how loved and respected he is by his former students. I think the tree may be ash. Love these magnificent front doors/entrances. A voice from your Canadian Past. 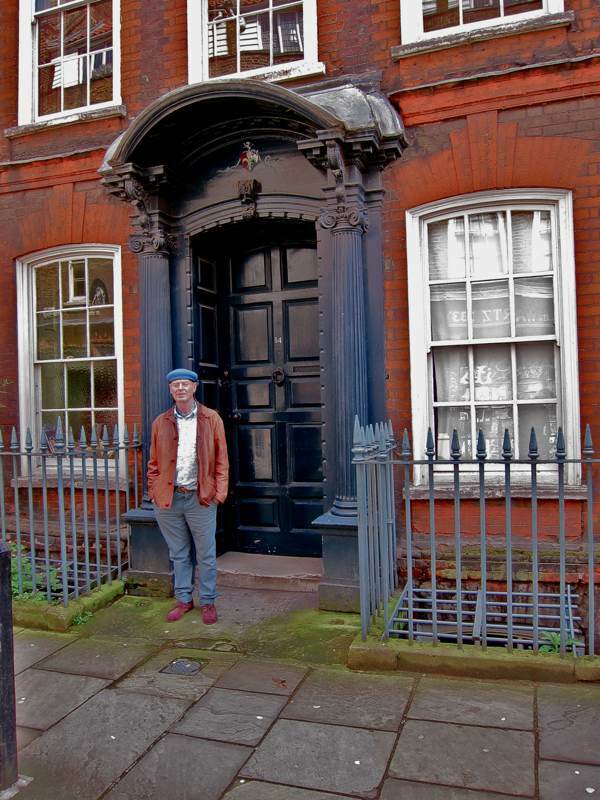 Just saw 31 Founier in “Great Houses of London”. I remember visiting Phyllis there shortly just after she bought it. There were renos in progress-kitchen I recall-and a bathroom had replaced the back yard privy. Glad to see your face smiling out from this interesting site. You look well and happy. How is sister Elaine? I am retired from law practice but teach interantional business law (after 46 years of doing it) to keep the aged brain from turning wholly to mush. Spouse Andrea Geddes Poole is a history prof. specializing in English 19th C. social/cultural. Her first book was on London’s four public art galleries and the handover of “stewardship” by the aristocrats. Second is about the two women who founded the Old Vic as a “cultural coffee house”, and Morley College for the working poor of the “wrong side” (then) of the river. Three daughters, 3 gandkids. Must visit next time in London. Often promised myself but never properly organized myself to do so when there. My email is mrobinson@fasken.com. Address 87 Tranmer Ave, Toronto M5P 1E3 . What a wonderful profile – thanks to both of you for sharing it!